In this week’s selection from Meanwhile, Back in the Library, you’ll find : an adaptation of classic horror story of sinister events in sunlit, small-town America; alien invaders causing chaos on Earth, despite doing absolutely nothing; and – because they’re visiting Sheffield Hallam this week- an exploration of nineteenth-century revolution and utopian dreams by Mary and Bryan Talbot. Mary and Bryan Talbot will visiting on Wednesday 28th November for two talks, which all Sheffield Hallam students and staff are welcome to attend: you can find out more on the Meanwhile, Back in the Library homepage. Meanwhile, Back in the Library is an exhibition about comics, graphic novels and cartooning: every week, our librarians will suggest three picks from the many comics in the library. 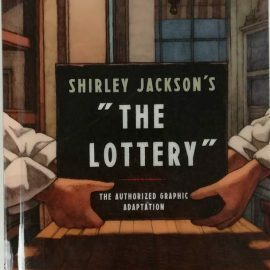 Keeping it in the family, this is an adaptation of Shirley Jackson’s famous, unsettling short story by her grandson: these days, the fable about something monstrous with the heart of society being accepted without question seems even more pertinent than ever. A gentle pace and plenty of everyday detail lets the horror build amid bright summer sunshine and small-town wholesomeness. Told in black and white with flashes of red throughout, this is a tale of those who hoped for a better future in the nineteenth-century. It’s primarily an account of the fascinating life of anarchist, feminist, and social activist Louise Michel, an indefatigable campaigner for the oppressed in her native France and beyond. But it also intelligently blends her history with that of the bloodily-repressed Paris Commune of 1871, as well as the forward-looking Utopian fiction of the time. A decade ago, the massive alien structures known as Trees arrived on Earth- and did nothing. But despite the apparent indifference of the Trees, their simple, inexplicable presence deeply affects humanity; at an experimental artist’s colony in China, a small town in Italy, an Arctic research station, and across the globe, the Trees exert their pressure on minds and societies. And yet, as this multi-stranded, near-future tale develops, it becomes worryingly clear that the Trees may not be so inert after all.